The effects of tooth loss are far-reaching, which is why the #1 goal of your general dentist should be the prevention of decay, gum disease, and oral health hazards that lead to missing teeth. One of the most significant side effects of having gaps in the smile is the deterioration of the jaw bone. 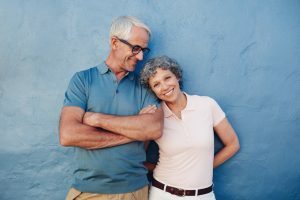 Keep reading to learn more about why it happens and how replacing the tooth with a dental implant can help prevent bone loss in Jacksonville. When you have lost a tooth, you are not just missing the visible part that helps you eat, speak, and smile. You have also lost the supportive root structure — or the part which brings important blood flow and nutrients to the jaw bone. Without all of your teeth roots, the jaw lacks what it needs to thrive. Resorption will occur. This degeneration causes the jaw to look weak or sunken and also leads to the loss of more teeth in quick succession. Fortunately, dental implants in Jacksonville can help restore your smile and prevent these dramatic effects of tooth loss. A dental implant is a comprehensive replacement for missing teeth. It doesn’t just take care of the missing crown — the titanium post gives you back the missing root structure as well. Titanium promotes the growth of bone tissue, encouraging the implant and the jaw to fuse together in the process known as “osseointegration.” By replacing the tooth’s root as well as the visible portion, dental implants bring all the lost nutrients to the jaw to continue to keep it healthy and whole. Dental implant procedures are completed over the course of two major phases: implantation and restoration. First, the implant post(s) are surgically placed beneath the gum line. 4 to 6 months later, after osseointegration has taken place, the tops of the posts are exposed once more and connecting abutments are placed on top. One more brief healing period is required before the prosthetic tooth/teeth restore the implants. In short, dental implants offer many advantages — and perhaps the most important for your oral and overall health is that they eliminate bone loss to help preserve your oral health. To find out whether you are a candidate for dental implants, do not hesitate to get in touch with your implant dentist in Jacksonville! Dr. Matthew Nawrocki specializes in beautiful, natural-looking dental implants. He is committed to helping patients rebuild their smiles after tooth loss. If you are already missing teeth or on the brink of extraction, you are invited to contact our office at 904-323-0928.